You are right Pen, JC is wearing a mitre. The crowns of the Austrian Empire and Imperial Russia incorporated a mitre of precious metal and jewels into their design. The Austrian imperial crown was originally the personal crown of the Holy Roman Emperor Matthias II (1612–19) and has the form proper to that of a Holy Roman Emperor. At their coronations as Roman Emperors in Rome the pope placed a miter on their heads before placing the crown over it. Their empress consorts also received both a miter and crown on their heads from a cardinal bishop at the same ceremony. The form of the Russian imperial crown dates back to the time of Peter the Great’s early attempts to westernize Russian and was probably inspired by the crowns worn by Habsburg emperors of the Holy Roman Empire but also from orthodox mitre. I'm wondering if the mitre was a symbol of one of the roles of the emperor - Defender of the Faith, perhaps? Pen wrote: And I found some funny little faces just below the King of Sword's knees (De Pee's knees...! 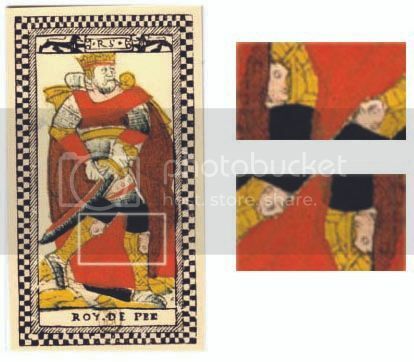 ), see below, enlarged the correct way up (for the faces), and reversed (as on the card). Is our King here a Chief Pedicurist (Roy de Pee*) ? Or a 12" ruler (12" = a king's foot). Roy de Pee = "pied-du-roi" (a measure used in Paris**) - a) twelve-inch rule or measuring stick b) carpenter's square c) carpenter's folding ruler. Thus it may be said, that he seeks to know the true measure of things. "The measure of a man is the way he bears up under misfortune" (Plutarch). *Pee= Norman french spelling for foot (pied) e.g., serjanzt de pee = foot-soldiers, men serving on foot; or, as in when the Lord Mayor of London in 1314 (when Norman French was the language of officialdom) forbid: rageries de grosse pelottes de pee (rumpusses with large footballs). **Les uns & les autres font réduits au pied de roi , qui est une mesure établie à Paris & en quelques autres villes de France; elle contient 144 lignes. Ce pied est divisé en douze pouces, le pouce en douze lignes, &Ia ligne en douze points.